Located opposite Alexandra Headland's most popular patrolled surf beach, BreakFree Alexandra Beach is conveniently close to Maroochydore, Mooloolaba, the stunning Sunshine Coast Hinterland and a wide range of local activities and tourist attractions. Accommodation at BreakFree Alexandra Beach features studios, penthouses and 1, 2 and 3 bedroom apartments set around a tropical lagoon-style pool. Each room enjoys kitchenette or full kitchen facilities, air conditioning, Cable TV and a private balcony or terrace, ideal for couples and families alike. BreakFree Alexandra Beach is also home to an outstanding range of leisure facilities including a heated 150 metre lagoon pool complete with heated spas at either end, waterslides, a pontoon and even a rapids section as well as a children's playground, gym, BBQ area, onsite shops, undercover parking, tour desk and more. Whether you stay close to the resort or venture out and about, you have the choice of doing as little or as much as you like. 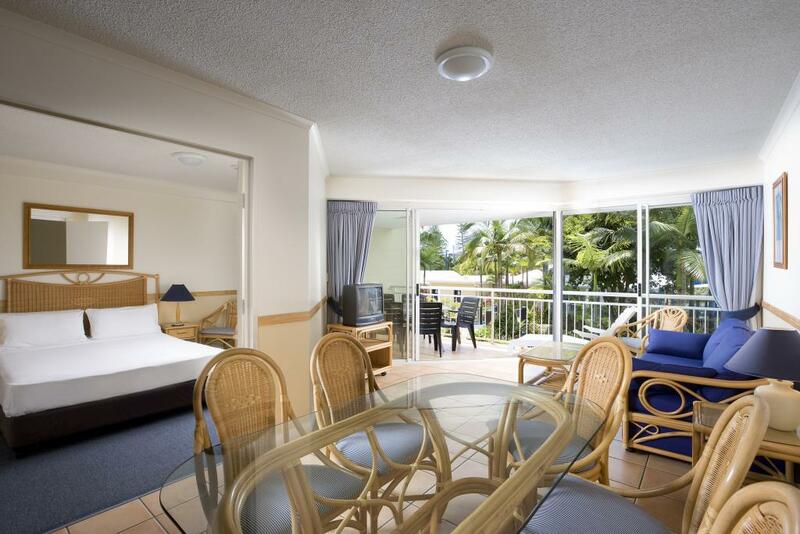 Offering easy access to some of the Sunshine Coast's best beaches, the stunning hinterland and a number of local attractions, BreakFree Alexandra Beach offers convenient and affordable accommodation for couples and families. Accommodation at BreakFree Alexandra Beach offers Studios, Apartments and Penthouses with spacious balconies or terraces. Studio: Features kitchenette including microwave, perfect for couples. Bedding is 1 Queen Bed OR 2 Single Beds. Maximum room capacity is 2 Adults & Children. 1 Bedroom Apartment: Features kitchenette including microwave. Bedding is 1 Queen Bed. Maximum room capacity is 3 Adults & Children. 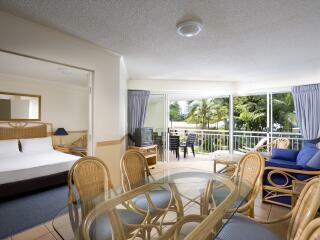 1 Bedroom Pool View: Features kitchenette including microwave and views over the tropical lagoon pool. Bedding is 1 Queen Bed. Maximum room capacity is 3 Adults & Children. 2 Bedroom Apartment: Features kitchen including microwave. Bedding is 1 Queen Bed + 2 Single Beds OR 2 Queen Beds. Maximum room capacity is 5 Adults & Children. 2 Bedroom Pool View: Features kitchen including microwave and views over the tropical lagoon pool. Bedding is 1 Queen Bed + 2 Single Beds OR 2 Queen Beds. Maximum room capacity is 5 Adults & Children. 3 Bedroom Apartment: Features full kitchen facilities. Bedding is 2 Queen Beds + 2 Single Beds OR 1 Queen Bed + 4 Single Beds. Maximum room capacity is 7 Adults & Children. 3 Bedroom Penthouse: Offers amazing space and features full kitchen facilities. Bedding is 2 Queen Beds + 2 Single Beds. Maximum room capacity is 7 Adults & Children. There are many restaurant options available all within a 50m stroll from the resort. Children: 12 years and under are free of charge on existing bedding in booked accommodation. Concierge told us to buy our own toilet paper!!!!!! Room ok but would never return after such bad service. Great spot, nice facilities but the shower in our room was terrible no pressure.